As Sam Bellamy and his newly captured flagship, the Whydah headed north toward Cape Cod, a successful pirating season seemed assured. Bellamy, his ship laden with cannons and small arms stolen from previously captured vessels, continued to collect prizes along the way. He captured and held the Anne, the Mary Anne, and the Fisher, smaller vessels that that tagged after Bellamy and the 300 ton, 28 gun Whydah. The huge pirate vessel housed 130 pirates and 16 captives, captains and officers of the captive ships. Bellamy may have been planning a revolution. Or he may simply have been heading north to see his old flame, Mary Hallett. For whatever reason, he was off the coast of Cape Cod on April 26, 1717, when one of the worst storms ever recorded hit the Atlantic Coast. 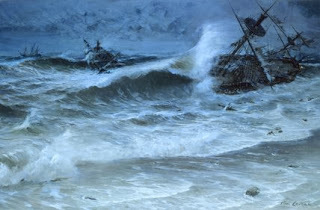 A Nor’easter from Canada met a warm front moving up from the Caribbean, and the resulting waves ran the Whydah hard aground on a sandbar, snapped her masts like twigs, and swamped her boats. Finally, the raging seas picked up the enormous ship and rolled her upside down. Though the beach was only 500 feet away, the frigid, turbulent waters were a death trap. Only two of the pirates aboard the Whydah made it to shore alive. Bellamy was not one of them. The two survivors, kidnapped carpenter Thomas Davis and Native American navigator John Julian were quickly arrested. The much smaller consort ships had fared better. The Fisher was damaged badly enough that she had to be abandoned, but her small crew of 5 pirates survived and transferred to the Anne. They joined the 19 crew aboard that ship and sailed away, hoping to find Sam’s friend Paulsgrave Williams and the Maryanne, which had missed the storm. The Mary Anne survived the storm, but lost all of her masts and rigging. The sailors aboard, several who were visiting the ship from the Whydah, were devastated to learn of the loss of the larger ship and most of their friends and companions. They were also afraid of being caught themselves. Abandoning their crippled vessel, they headed off on foot. They might have gotten away, had they not stopped at a tavern to toast their fallen comrades. They were arrested by sheriff’s deputies and hauled off to Boston for trial, along with their two comrades. It would be 7 months before these men, still wearing the clothes in which they weathered the storm, were tried for piracy in Boston. During that time the fire and brimstone minister, Cotton Mather, visited them in prison and recorded their stories. When they faced the judge, three men escaped the death penalty for robbery and piracy. Thomas Davis successfully convinced the judge that he had been pressed into service by pirates who needed his carpentry skills. John Julian, the Native American was sold as a slave. The rest, Thomas South, Peter Cornelius Hoof, John Shaun, John Brown, Thomas Baker, Simon Van Vorst, and Hendrick Quintor, a free black man who had signed aboard Bellamy’s ship, were sentenced to be hanged. The sentence was carried out in Charleston on November 15th. Cotton Mather, who accompanied the men to their hanging, published a pamphlet about their lives called “The End of Piracy,” though piracy certainly did not end with Sam Bellamy. John Julian was sold to John Quincy, grandfather of President John Quincy Adams, who became a staunch abolitionist. “Indian John” as he was called, never made a good slave. He was unruly, and tried multiple times to escape. 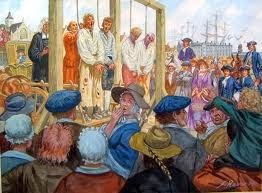 He was finally killed in an escape attempt in 1733. The remaining free members of the Whydah’s crew sailed north until they met up with Paulsgrave Williams. They joined his crew and headed back to the Caribbean. All of the pirates had spoken of the great treasure contained in the Whydah’s hold, but efforts to reach it turned out to be futile. Thirty feet of water was simply too much for the technology of the time to overcome. 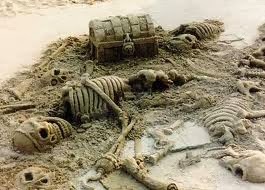 So the treasure remained on the ocean bottom. Cotton Mather’s pamphlets and notes were put away. Knowledge of Sam Bellamy and his magnificent ship the Whydah faded into local legend. It was said, in the area around Cape Cod, that a local girl, Mary or Maria Hallett, had been betrothed to a man who became a pirate. I was just reading about the Whydah in a book by Edward Rowe Snow -"Storms and Shipwrecks of New England". Thanks for sharing this. "30 feet of water was simply too much for the technology of the time to over come". 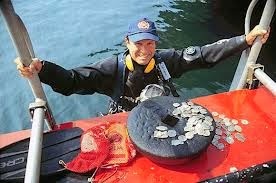 The Rhodian Sea Laws dictated that salvage divers get more pay for the deeper they go. The highest pay bracket was for 90 feet depth or more. The Rhodian Sea Laws were written in 200BC. So 30 feet was definitely manageable by 1718.